During the summer of 2014, to honor the 2014 FIFA World Cup, I decided to put together a list showing some of the benefits of playing soccer. Once you read this list, which is certainly not exhaustive, you can clearly see why soccer is the #1 sport in the world! FIFA World Cup took over all forms of media, especially social media. The frenzy was observed in parks, restaurants, stores, well, let’s face it, EVERYWHERE! Now, I have never been a big professional soccer fan (I’m sorry! ), but even I found myself swept up in the excitement and action. Fall 2013, was the first time I entered into the world of soccer. I never played as a kid, even though I really wanted to. I was so excited for my son to play; however, as all parents know, things don’t always go as planned. 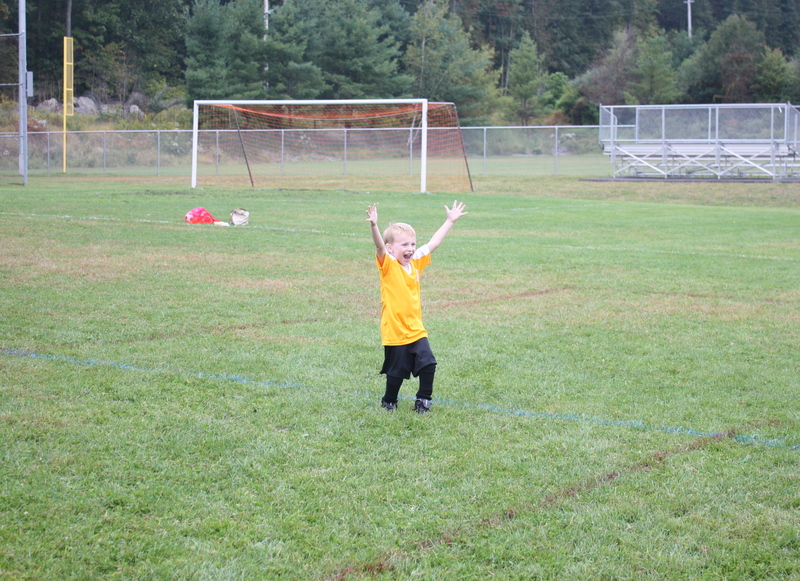 Although my son LOVED practice, when it came to games, well, he just stood there. Despite this experience, my son continues to ask when he will get to play soccer again! Even though my son was not the star, not even close, I still found so many benefits in this exciting sport. Helps kids stay fit and healthy: Playing soccer is great exercise that improves cardiovascular health, increases coordination, improves strength and enhances flexibility. Involves teamwork: Soccer players have to work together as a team in order be successful. Teamwork is a skill needed to be successful in school, work and family! Improves gross motor skills: This is especially important for kids that are weak in this area. It helps strengthen core muscles which allows kids be more physically active thus more healthy! 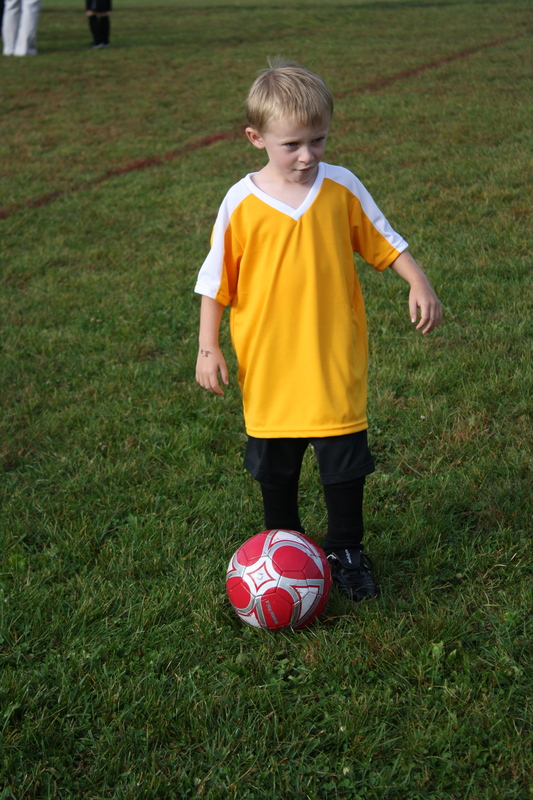 Boosts self-confidence and self-esteem: Playing a sport, such as soccer, helps kids gain confidence in themselves. They become more comfortable learning new things and performing in front of a crowd. Of course scoring a goal helps too! Increases social interactions: Since soccer is a team sport, it requires players to communicate through a variety of ways. Players also have to learn how to work together and communicate effectively in order to be successful. Increases concentration and focus: Playing soccer involves a great deal of focus and attention in order to be successful. Players need to always be aware and alert throughout the game or they will miss important plays and opportunities. Competition creates motivation and drive: When kids are motivated and driven, they become more successful students and adults. Involves work ethic and responsibility: Being an athlete requires a certain level of responsibility to your team, your coaches and yourself. Playing sports also requires a good work ethic or success will not be within reach. Promotes cognitive development: Playing soccer helps kids enhance their visual-spatial awareness as well as problem solving skills. The fast pace of soccer makes kids think quickly and respond. This improves cognitive flexibility. It’s fun! It is so important for kids to LOVE the sport they play. Soccer is fun and exciting which is why it is one the most popular sport in the world! Have fun playing (and watching) soccer this season! Soccer is an awesome sport for all ages. It builds fitness, motor skills, coordination and so much more. It is an ultimate team sport as well. Thank you for following Mommy University! I agree that soccer is a great sport! Hello, very good article on the benefits of playing soccer. As i see my son play soccer, i feel it is a great sport and completely agree with your observations in respect to the benefits that can come with playing soccer, specifically interaction with other kids, team work, confidence and several other things that you don’t get to see while they are not involved in a sport. My daughter played last spring and loved it. Both of my kids want to play in the fall so I signed them both up. I agree, it’s great for them! I love team sports! There are so many life lessons that can be learned through sports. I like that you mentioned that kids who play soccer have increased social interactions. When kids are young it can be hard to get them involved with other children. My son is getting old enough to play sports and I want to make sure he gets involved with a team so that he can be more social. I will have to look into soccer for him. I agree that soccer can improve focus and attention, especially in younger children. It’s important that those playing soccer have the right tools and equipment to help them focus and feel successful. I think it helps, too, when they have a real net to use when they are shooting goals. It gives them more time to focus on shooting the ball rather than running and getting the ball constantly. I’ve been wanting to get my son into a sport, and was thinking soccer. You wrote that soccer really focuses on core muscles, which will help you kid stay healthy. Perhaps if I got some goal posts for my son to use, him and his friends could come use it and get really into soccer. Thank you for the read. I really appreciate your tip on how soccer can actually increase your core muscles and make you healthy! My wife told me that she is concerned our son is sitting around playing video games too much, and she wants him to be more active. I will be sure to tell my wife that we should get our son started in soccer!